When you want the style and durability of other flooring options at minimal costs, check out our great selection of resilient flooring. Come to our fully-stocked warehouse showroom, and we’ll give you a guided tour of our selection of luxury sheet vinyl, vinyl plank, luxury vinyl tile, and other resilient materials for any application. The flooring industry defines resilient floors as highly durable, easily maintainable, and affordable flooring solutions. Let our flooring experts help you find the best material for your new resilient flooring. Do you have bad memories of old vinyl? Luxury vinyl has entered the modern age through a combination of technological advancements and improvements in manufacturing. Luxury sheet vinyl is more affordable than ever, and vinyl plank or tile can be customized to simulate almost any type of natural flooring material you want. Modern vinyl is divided into two general categories by application and style. Luxury sheet vinyl comes in sheets from six to 15 feet wide. These are just as convenient and easy to install as traditional vinyl, but with significant stylistic advantages. Installing sheet vinyl minimizes any seams in your flooring, which practically eliminates the amount of dirt, allergens, and moister that infiltrate your floor. It also makes maintaining the flooring easy work. Luxury sheet vinyl can be almost completely customized to match any style preference, whether you want to simulate natural stone, wood, tile, or any other flooring material or pattern. 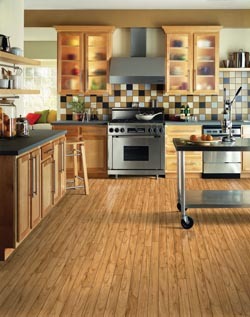 For the natural look of wood or tile, count on our selection of luxury vinyl plank (LVP) or luxury vinyl tile (LVT). These are boards or tiles made from vinyl material that simulate natural hardwood or tile at a fraction of the cost. Not only is the cost of materials more affordable, but wood vinyl plank or luxury vinyl tile installation is quicker and easier to install than natural material. Rely on our professionals to provide a great-looking floor at a price that can’t be beat! The greatest advantage that luxury sheet vinyl holds over traditional vinyl is eco-friendliness. Not only is new vinyl more affordable, it is also better for the environment. Traditional vinyl wasted natural resources, and some old vinyl even contained asbestos. Modern vinyl has left behind these problems. Advances in technology mean that vinyl plank flooring is greener than ever before. As well, it is easier than ever to recycle luxury vinyl at the end of its lifetime. All of this means that this is the perfect time to invest in a stylish, affordable and durable luxury sheet vinyl or tile floor. Contact us today to discover the amazing home flooring of tomorrow. We proudly serve customers in Anderson, Greenville, Easley, Clemson, and Seneca, South Carolina as well as surrounding areas in Western North Carolina and Northeast Georgia.